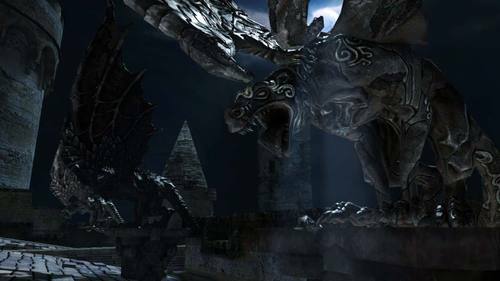 Gargoyles were sentries created by the ancient gods of Anor Londo. Some were originally made to guard the Bell of Awakening atop the Undead Parish and to patrol the streets of Anor Londo. Since then gargoyles have appeared in many forms in all the great lands throughout history. They are known to guard castles and forts from ill fortune. The Prince of Alken likely knew about gargoyles and their uses in history. To protect the bell of his beloved Princess of Venn from those who would stop the Bellkeepers from ringing it (“We've been ringing this bell forever, we have! Ah hah hah hah!”) by removing the bell, he had them meticulously crafted and given life. The Prince of Alken or whoever created these gargoyles, gave them a two-pronged spear (a bident) that imitates a weapon mentioned in an ancient text, so it is clear that they had read about them. The gargoyles protect the seaward front to the Bell of Venn (held in Alken), as it is perhaps unlikely that an attempt to stop the bell from ringing would be made from within the Lost Bastille as the entrance to the Belfry Luna is hidden by a Pharros Contraption. There are 5 gargoyles that mysteriously come to life in the Belfry Luna. Some of the statues have had their heads broken off, and like the stone soldiers of Drangleic castle, they do not rise to attack you. It is interesting to note that some of the gargoyle statues can be found in the King’s treasury at Drangleic Castle in the same room as the Dragonrider duo, however they don’t come to life. It may be that Vendrick copied these statues after visiting the Belfry Luna in his travels.